Hi everyone. I am so happy to be sharing with you some of the things I have learned about healing autoimmunity and a few of my resources that have helped me most. I am eager to hear from you below in the comments box, so please share some things you have tried while on your personal path to whole wellness. Throughout this entry I have inserted links to websites that will be helpful in answering your questions as we go along. Because this entry is particularly comprehensive, I will divide it into two entries. You can go from Part I to Part II in one reading, or simply read part II later. Together they are one continuous article to help your body heal. Let’s begin with a brief review of what we do know about autoimmunity . • Autoimmune disease is one of the top 10 leading causes of death in female children and women in all age groups up to 64 years of age. • Commonly used immunosuppressant treatments lead to devastating long-term side effects. • The Institute of Medicine reports that the US is behind other countries in research into immune system self recognition, the process involved in autoimmune disease. What is possible for you and me? The web is filled with professionals and lay people speaking out about numerous protocols available to us for under $300.00. This figure does not include the cost of supplements, and organic food. This is such a new field of study (and because of unique presentations of symptoms from one patient to another) there is very little clinical evidence to support these programs for healing. However, there is a wealth of anecdotal testimony. And there are tests to determine autoimmunity, food and environmental sensitivities, and remission of symptoms. The best way of knowing how you are responding to a treatment, whether you’re taking medication, or changing your diet, lifestyle choices, or supplements, is by how you feel. The process of discovering what “works” is so new the health insurance companies have not caught up. As of now, they do not pay for healing protocols or many of the tests which can confirm your body’s deficiencies. This is one reason (our sense of personal empowerment is another) for all of us with an autoimmune condition to become responsible for our healing process. Honestly, is there anyone else who has your unique symptoms, your desire to get well, or your individual obstacles to wellness? I don’t think so. It only makes sense that you are the only one to choose what to do for you. Ask your doctors, your informed practitioners, to give you options. If you do not hear one you can use, then find a different doctor. In the end, you are the one accountable for your health. Choose the counselors, and the steps along the way, for yourself. Listen to your body and trust it. When you take a wrong turn, your body will let you know within few days, or as little as fifteen minutes, long before you are able to do any irreversible harm. Practice feeling how your body feels. Locate the discomfort or pain and then ask it, “What is it you want me to know?” Set your intention to listen and honor what ever comes up first. Your mind will want to ignore the first response for the “right” one, or the one you already know. Trust your body and go where that process takes you. 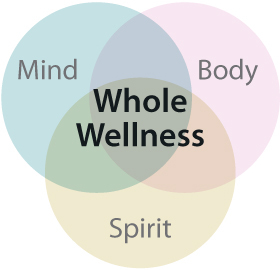 In my September 3rd, 2015 entry we’ll consider the mind/body connection and how this practice can help you choose what is good for you. It took a while to begin to trust my body and myself. I first wandered around in resistance and denial, then anger, and finally mourning. I used up about a year looking for the magic fix that would take it all away. And when I knew I could not get any worse and stay alive, something happened to inspire me to take responsibility and move forward. My kids and grand kids had come for their annual summer visit. As usual, all the family headed to the lake and an evening boat ride, a swim and picnic before the sunset over the Smokys. But I wasn’t going. I was in bed where I spent most of each day sleeping. At 5’8″ and 103 lb, having lost 50 pounds over three months, I had developed hypothyroidism, double vision, an inability to chew or swallow, a chronic bladder infection, diarrhea, joint pain, swollen glands, fevers and incredible weakness from (at the time) undiagnosed Lyme Disease. That was when I decided I would not live like that. And, as of that evening, seeing my family put-putting off in our pontoon boat, dying was not an option. The first thing I learned was that I did not get sick in a month, or a year or even two. Healing was going to take at least that long or more. (I keep forgetting this, but when I am most frustrated and impatient, this core understanding does come back to me.) Finding out what worked and didn’t work for me took a lot of trial and error. So throw out your inclination to want to get it right with the first or second try. You berate yourself and your autoimmunity just gets worse. Stop it. Or rather, change it. Substitute a half hour detox bath in Epsom salts every time you find yourself pushing yourself for the perfect doctor, the perfect book, the perfect protocol. Take one step forward today and see what shows up. The second thing I learned after trying several protocols is that my body and I are unique. Some protocols worked for me and others did not. I began with Jordan Rubin’s program, The Maker’s Diet, for healing Chron’s Disease. http://www.crohns.net/miva/education/articles/HSO_PrimDef.shtml (My diarrhea began after three months of oral and injected antibiotics for a persistent bladder infection that wiped out my intestinal flora.) After six months of gaining strength on the Rubin protocol, I plateaued. I was only maintaining the progress I had made and a few new symptoms were showing up (I later learned that this is part of the healing process, to have one issue disappear and another develop for a short time and then go away.) I was impatient, my breathing was more labored and I began having panic attacks at night in bed. While the diarrhea was nearly gone, and I’d put on 15 pounds (hooray! ), I was still weak and took a pill an hour before meals to swallow food or drink.